. Oku no Hosomichi - 奥の細道 - Introduction . I arrived safely at the town of Kurobane, and visited my friend, Joboji, who was then looking after the mansion of his lord in his absence. He was overjoyed to see me so unexpectedly, and we talked for days and nights together. His brother, Tosui, seized every opportunity to talk with me, accompanied me to his home and introduced me to his relatives and friends. One day we took a walk to the suburbs. We saw the ruins of an ancient dog shooting ground, and pushed further out into the grass-moor to see the tomb of Lady Tamamo and the famous Hachiman Shrine, upon whose god the brave archer, Yoichi, is said to have called for aid when he was challenged to shoot a single fan suspended over a boat drifting offshore. We came home after dark. I was invited out to the Komyoji Temple, to visit the hall in which was enshrined the founder of the Shugen sect. He is said to have travelled all over the country in wooden clogs, preaching his doctrines. Asking a blessing on my journey.
. Basho and Tamamo no Mae 玉藻前 - Tamamo Gozen 玉藻御前 . was a samurai who fought alongside the Minamoto clan in the Genpei War. After Basho's timely visit to Unganji, the rains kept falling for several days. From the 6th to the 8th, he was not able to leave Choboji's house. On the 9th, however, he decided to go out in the rain and was taken to Komyoji, a shugendo temple in the fields on the east side of the town. This temple was famous for its Gyoja Hall, a hall dedicated to En no Gyoja, the legendary founder of the ascetic mountain Buddhism. The 'ashida' mentioned in the poem (here translated as clogs) are a special kind of high geta, worn by those monks when practicing austerities. To make walking difficult, these geta had only one support instead of the normal two. The temple probably housed a statue of En no Gyoja wearing such high clogs. Basho prays in front of them, wishing for strong feet and legs himself at the start of his long journey. Unfortunately, Komyoji was destroyed at the beginning of the Meiji period. 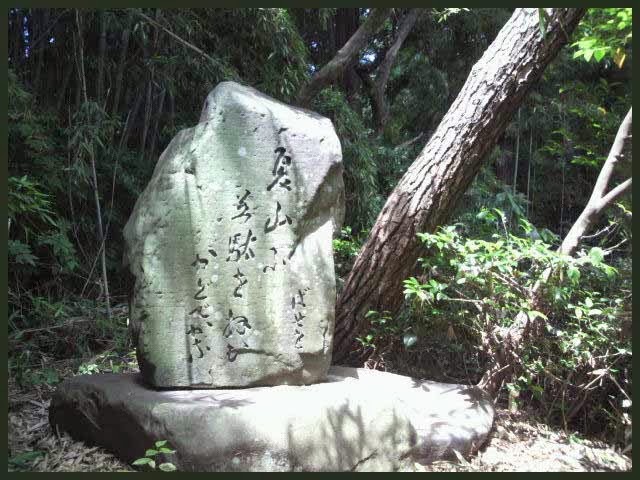 The haiku stone stands forlorn in the high grass. For haiku fans, the quiet former castle town of Kurobane in northern Tochigi is an important pilgrimage place, as Basho spent two weeks here in 1689 on his way to the Deep North.
. tsuru naku ya sono koe ni bashoo yarenu beshi . a crane screaches . . .